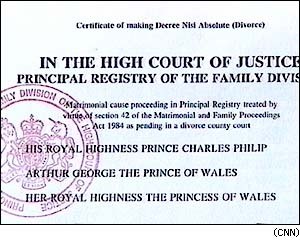 In the High Court of Justice Principal Registry of the Family Division. Matrimonial cause proceeding in Principal Registry treated by virtue of section 42 of the Matrimonial and Family Proceedings Act 1984 as pending in a divorce county court. Between His Royal Highness Prince Charles Philip Arthur George the Prince of Wales and Her Royal Highness The Princess of Wales. 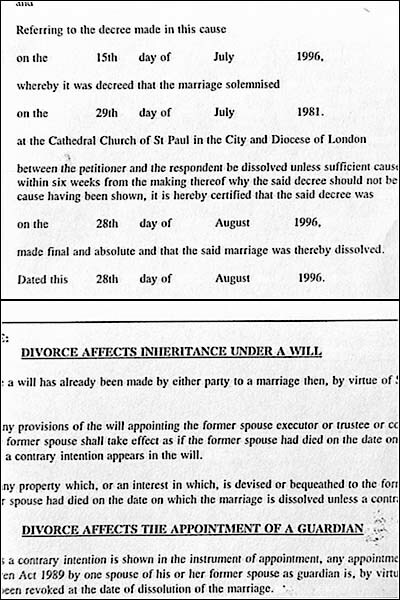 Referring to the decree made in this cause on the 15th day of July 1996, whereby it was decreed that the marriage solemnized on the 29th day of July 1981 at the Cathedral Church of St. Paul in the City and Diocese of London between the petitioner and the respondent be dissolved unless sufficient cause be shown to the court within six weeks from the making thereof why the said decree should not be made absolute. And no cause having been shown, it is hereby certified that the said decree was on the 28th day of August 1996 made final and absolute and that the said marriage was thereby dissolved. Dated this 28th day of August 1996.